Aerial Power introduces the worlds first cleaning drone. – The SolarBrush drone is the first drone that cleans and inspects solar panels. Aerial Power is the first company to develop a fully automated drone-based method for cleaning solar panels. Called ‘SolarBrush’, our specially adapted Unmanned Aerial Vehicle (UAV) is an efficient, low maintenance, and environmentally friendly way of maintaining solar farm efficiency. Our cleaning drone is self-flying and eases the maintenance of solar power plants. In comparison to other cleaning methods, our solution is environmentally friendly as it has lower emissions, plus is cheaper to use. It requires few staff and is easy to transport. The waterless cleaning process of our drone is fast and cost efficient, and its operation has a light ecological impact. It can leapfrog existing cleaning technologies, especially in developing countries, due to its supreme flexibility. Our cleaning drone has its most significant contribution towards increasing the yield and viability of solar farms in arid regions of the world, where the main factor in deteriorating panel efficiency is the build up of dust on the surface of glass panels. Importantly, solar panels need to be cleaned frequently in order to maintain their output efficiency. Studies in the UAE show that if left uncleaned for a month, power output can decrease by up to 35% – and by as much as 80% after a sandstorm. 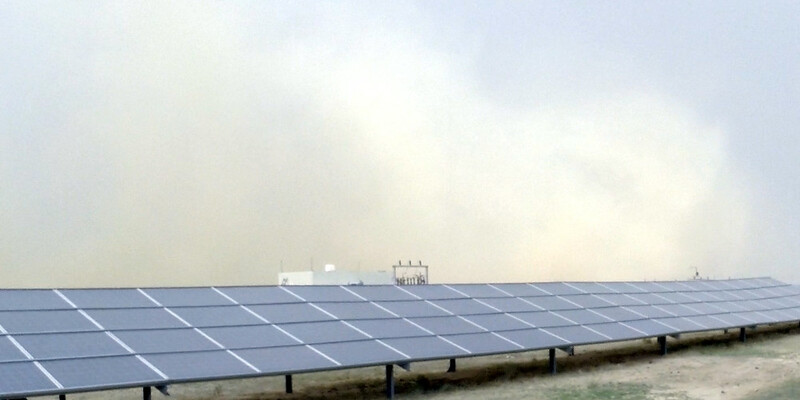 In such arid regions the main factor that causes panel efficiency to deteriorate is the build up of sand and dust particles on the solar panel surfaces. Cleaning solar panels using our UAV technology is effective in many areas of the world, but especially so in arid regions, where the maintenance costs of panels can be slashed by up to 60%, whilst at the same time increasing energy production.